Custom made corner booths covered in white cap weave vinyl. Georges Paragon Express Restaurant at Mount Tamborine. Cazalys Recently extended and re furbished there Sports Club in Cairns they selected Italian made Vesta chairs with and without arms, Compact laminate table tops in a range of sizes and Colours to accommodate 300 chairs. Extra Lounge Seating and Drinks tables were also supplied along with our Cello chairs and stools for the external areas. Complemented with 800 x 800 Wenge tops on Polished Chrome Arch and Black Cast bases. 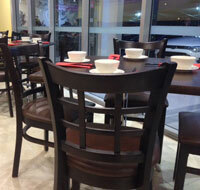 Located at Mt Tamborine, this fit-out consisted of tables, chairs and lounges. Osborne Waterfall resin wicker dining chairs for indoor and matching lounges and coffee tables for the outdoor area.